Team Gretzky came to the Garage for a rematch of the Opening Night game on the 5th. In this game, Curtis Joseph was nearly able to pull out the win if not for a couple of bounces that went the Canucks' way. Also a more unfortunate thing about this game was the rash of penalties. There were lots of games in the preseason where there'd be a billion penalties and the whole game would be spent in special teams situations, but it leaked into the regular season here. Another bad thing: the Canucks came into the game with the NHL's 29th-ranked penalty kill. That's not good. However, this was mitigated by the fact that they don't land themselves in the penalty box as often as their opponents. The first period saw Curtis Joseph doing a yeoman's job in the net, and Vancouver only got one goal as a result. Early on, Shane Doan took a long pass and put the puck off of Dan Cloutier's shoulder. Matt Cooke was called for a hook just 76 seconds into the game for putting his stick on a player's hip. Ryan Kesler missed on a shorthanded break because he was hooked from behind, and that took Phoenix off the power play. Mattias Ohlund took a pass from Todd Bertuzzi and couldn't quite one-time it, but the shot he did put on the net was robbed by Joseph on the goal line. Right after the play, Ohlund was called for interference. Henrik Sedin had a couple of close shots on the net which were rebuked by Joseph. Boyd Devereaux was called for high-sticking Bryan Allen, who clutched his face afterward in pain. Sami Salo let a one-timer fly, but Joseph made a blocker save. The Canucks moved the puck nicely along the outside before Brendan Morrison and Ed Jovanovski went to the net, and Markus Naslund centered to Jovanovski, who tipped it into the net to make good on the power play. Phoenix had a sloppy line change soon after, having too many men on the ice, but it wasn't called. Brendan Morrison and Bertuzzi on a rebound had their shots stopped by Joseph. Bertuzzi and Baumgartner were stopped on rush as well. Jarkko Ruutu pulverized Fredrik Sjostrom with a hit. Cloutier successfully challenged former Canuck Geoff Sanderson on a shot. Ruutu was cross-checked in the back of the head, which wasn't called. After his quick shot was stopped by Joseph, Anson Carter won a scrap with Keith Ballard. Salo had a one-timer gloved by Joseph. Richard Park was held by Zbynek Michalek, and Devereaux cleared the poke over the glass from his own end, setting up a Vancouver two-man advantage for 76 seconds. Salo had a one-timer stopped by Joseph's shoulder. Another Salo one-timer was stopped, and the first penalty ended. Ohlund from the slot (stopped) was the final Vancouver shot of the period. Before the end of the period, Devereaux went to the box again, this time for a hook. Then Vancouver got called for too many men. Doan was knocked down in the neutral zone, putting Vancouver down two men again for 51 seconds. Yes, the game wasn't sloppy at all. Vancouver peppered pucks on Curtis Joseph and led 19-11 on shots after the first period. Park had a wrister go off the heel of Joseph's glove. The Vancouver penalties from the end of the first period expired. Instead of kicking the puck down the ice to clear, Bertuzzi was called for tying up Michalek. 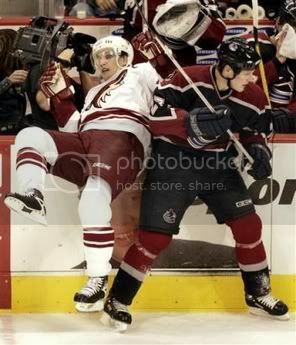 Almost immediately after the Bertuzzi penalty, Phoenix was called for too many men. Ballard had an unimpeded path to the net on Dan Cloutier's blocker side, and Ballard put one in over the goalie's right shoulder. Derek Morris put a shot on the net, and Mike Ricci knocked Cloutier, though Cloutier may not exaclty have been trying to avoid the contact. Ricci wasn't called for a penalty. Trevor Linden twice took passes from Lee Goren and had decent chances on the net. Michalek hooked Linden, who was hurt and went to the dressing room, but came back before the end of the period. On the ensuing power play, Bertuzzi rifled a one-timer on which Joseph made a huge glove save. Morrison passed to Naslund for a quick shot that went off of Joseph's pad. Carter had a shot leak through the crease and out the other side. Nolan Baumgartner rifled a slapshot from the back of the left circle to beat Joseph, who may not have seen the puck, up high. Park centered to Morrison, who was pad-stopped by Joseph. Ladislav Nagy's high stick clipped Steve McCarthy, and Canuck trainers had to attend to the latter. No penalty was called on the play. Mike Comrie and Geoff Sanderson worked a great give-and-go rush, with Comrie's pass moving Cloutier from his left to his right, and Sanderson put it in on Cloutier's short side, which hadn't closed up quickly enough. Ballard hooked immediately after the goal, putting the Canucks on the power play, which was killed. Cooke had the puck roll off his stick on a breakaway. Allen had a wrister stopped by Joseph's blocker. Park was hauled to the ice, but no penalty was called. What was called as a trip on Morris for bringing down Goren. Ed Jovanovski was pulled down at the line by Petr Nedved and clutched his left leg, though he stayed in the game, and Vancouver was set for 1:39 of two-man advantage time. Bertuzzi had a high slapshot stopped, and Naslund couldn't put back the rebound. Bertuzzi then took an interference penalty to pull Vancouver off the two-man advantage. Three seconds after the Morris penalty expired, Ballard was called for a hook inside the final minute of the period, putting Vancouver back onto the power play. Vancouver outshot the Coyotes 11-7 in the period and led 30-18 overall. Naslund passed back despite having a clear path to the net. Morrison centered to Bertuzzi, who tipped it to the net but Joseph made a nice save. Vancouver got away with having too many men on the ice at one point. Ohlund drove in on Joseph and was stopped. Cloutier held tough for a couple of decent Phoenix shots. Allen went to the box for interference, ending a streak of five straight power plays in Vancouver's favor. Morris shot, but Cloutier went to his knees to make the stop. Salo took a high-stick from Nagy, who went to the box. Ed Jovanovski and Matt Cooke got on a 2-on-0 rush; Jovanovski had Oleg Saprykin trying to dive across the ice, put his stick out and somehow interfere with Jovanovski as he crashed the net and shot in. Jovanovski's shot was stopped, but the rebound went to Matt Cooke, who was bearing down and put the puck in the net as it came off. The goal was immediately waved off by referee Mick McGeough. Jovanovski had a guy trying to trip or bump him with a stick, had his shot stopped, then Cooke put the rebound in and subsequently knocked into the net, which was now moved behind the goal line and off to Joseph's glove side. It was given back to Cooke after video review from upstairs and from Toronto (more on that later). Naslund was stopped in close by Joseph. Sjostrom was stopped with a left pad by Cloutier, who also gloved a wrist shot right afer that. Ohlund was called for pulling down Nedved, who was going for his own rebound. Park ran a couple plays the other way shorthanded, nearly breaking away once, then putting a shot on the let that was stopped by Joseph's left pad. Paul Mara was hauled down by Ryan Kesler, putting Phoenix on a two-man advantage for 76 seconds. Allen blocked a shot with his skate. Morris shot a one-timer that was blocked by Linden, but wasn't cleared. After the first penalty, Morrison was knocked to the ice on a shorthanded chance and lost the puck, but there was no call, though the second penalty was about to expire. After stopping a Mike Johnson shot, Cloutier lost his stick and played with Salo's stick for a short time before Salo waited for play to die down a bit before going to fetch Cloutier's stick. Both Daniel Sedin and Sanderson went off for diving and hooking, respectively, with just under three minutes left in the period. Ohlund held a shot back, then deked before putting up a shot that bounced up and hit the crossbar. Oleg Saprykin deked but got in too deep to make a shot. Allen was whistled for a hold with 1:27 left, which put the Canucks in a sticky situation and the Coyotes onto a power play. Nedved had a one-timer stopped, but it wasn't cleared. Morris shot a one-timer that was also held in the Vancouver zone, and at this point it was a 6-on-4 as Joseph was pulled from the net on the other end. Doan had a one-timer hit the bottom of the crossbar and never cross the goal line, though the puck again wasn't cleared past the zone. Morris put up an off-target shot that again was held in the zone. Finally, Ohlund battled two Coyotes for the puck and cleared it, sealing the game, and since Vancouver was shorthanded, there would be no icing as the clock ran down. Vancouver outshot Phoenix 8-6 in the final period and the total was 38-24 for the game. Cloutier stopped 22 shots. There were a combined 26 penalties, 18 power plays and 58 penalty minutes in this staccato-paced game. The teams spent a combined 25:24 on the power play. Someday the players will get used to all these rules. Or someday the refs will lay back just a bit without totally backing down on the enforcement of the new rules. I think the former will be more likely. By the way, Vancouver was 2-for-10 on the power play and they held Phoenix to an 0-for-8 night on the man-advantage. That winning goal was a video-judge goal that went upstairs and to Toronto for review. The rule in the rule book that applied to the situation was Rule 57a, which was read during the Canuck radio broadcast. Basically, it says that the goal frame has to have either or both pegs out of their holes or the net has to come completely off for a goal to be disallowed. The way I interpret this is that no defenseman or goalie can kick the net off its moorings when it looks like a puck might find itself into the net; such a play could have resulted in a disallowed goal in the past. The radio crew thought the initial disallowance of the goal was correct until they read Rule 57a, and apparently with the aid of multi-angle replay (all I have is the goal reel from NHL.com), the puck went in with the net having come up an inch or an inch and a half, but not completely off the peg, which was rumored to be 3-4 inches tall. It's surprising for me to see a disallowed goal later allowed on replay (usually it's the other way around), but it counted, and Vancouver ran with it. Of course, Ohlund and Doan had chances earlier in the period that were very close to being goals as well. Other than the ruckus over the winning goal, the Canucks got more scoring from their defensemen, totaling four points in this game. Things like blueline scoring and a goal that bounces your way are the kinds of things a team needs to beat a spectacular Curtis Joseph, who came in with a 1.80 goals-against average and was on fire in the first period. Joseph was the default starter after Brian Boucher went on the shelf, but I think that was an eventuality. Cujo's still got something left. Here's the superstats bonanza. Matt Cooke and Ed Jovanovski were the only plus skaters (plus-1) for the Canucks. Mattias Ohlund was the lone minus-2 Canuck. Nolan Baumgartner, Trevor Linden, Daniel Sedin, Lee Goren, and Jarkko Ruutu were all minus-one. All other skaters were even. Vancouver was 30-for-62 (48%) on faceoffs. Brendan Morrison was 9-for-22, Trevor Linden was 4-for-9, Ryan Kesler was 3-for-7, and Henrik Sedin was 10-for-17. Bryan Allen, Sami Salo, and Matt Cooke doled out three hits apiece. Salo led the team with six shots. Markus Naslund and Todd Bertuzzi had four shots apiece. In the third period, Canuck radio play-by-play man John Shorthouse won the 50/50 draw at GM Place. Apparently, color man Tom Larscheid and Shorthouse have been playing the 50/50 draw for seven years at Canuck home games, and they finally won. Larscheid said that Shorthouse usually sits there with the ticket as the numbers are read off saying "yes..." with every progressive number until it ends up being the wrong ticket. This time, it was "yes...yes...yes...yes...yes...Tommy, I think we've done it!!" Shorthouse later declared it "the greatest night of hockey ever in GM Place," which obviously wasn't the case given the horrible flow of the game. The Canucks, winners of four straight, are now 6-1-1 on the season. They hold a four-point Northwest Division lead over the Minnesota Wild and hold a eight-point lead over last-place Colorado, who the Canucks host on Saturday. The Canucks' next five games are all against Colorado or Minnesota, two key division rivals.